Tel & Fax Number: +27 (0)44 382 3080 (from 9am - 5pm)The office is not manned all day so please e-mail with enquiries. Follow the N2, go thru the first set of traffic lights,( by Kwik-Spar and the Caltex garage), Pass the Knysna Public Hospital on your right. Turn left at the very next traffic light into Waterfront Drive. Continue along Waterfront Drive through the first traffic light. At the next traffic light take a left into the Knysna Waterfront parking. First light you encounter to the right. Into Waterfront Drive, carry on past the Caltex garage. At the next light turn right into the Knysna Waterfront parking. 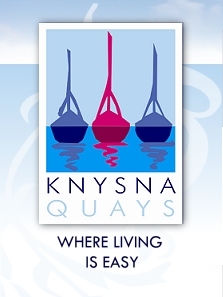 Knysna Quays offers luxury holiday apartments and activities, enjoy the Knysna garden route and waterfront as well as golf packages.